My chosen career as a Certified Public Accountant opened up many new possibilities to financial freedom. Several years later, an unexpected and painful divorce started me on a spiritual quest, asking the Why’s and What for’s in life and forcing me to explore more deeply my own spirituality. During this journey, I observed that many of the spiritually centered friends and associates I encountered had financial difficulties. This was unlike people in the financial world, who had the tools and the knowledge to create and manage their finances, but were missing an inner connection, divine direction or inspiration and were fueled by fear-worrying about money, saving it, protecting what they had created. It became clearer and clearer that something was missing and there must be a way that we can all experience true Financial Freedom. It was during these times that I had the vision to create a process to bridge this gap. What better way to learn and demonstrate spiritual principles than through the very visible manifestation of ones thoughts, beliefs and energy—MONEY. How is my coaching program different? Most financial freedom programs focus on what I call the nuts and bolts-budgets, credit card debt, saving, investing-all about doing. Most prosperity programs focus on the being aspects - connection with spirit or spiritual principles, work on limiting beliefs, etc. You can’t have true financial freedom if you are living in fear, worrying about your money, spending all of your time dealing with it… And You can’t be prosperous if you are living by platitudes, meditating and creating affirmations, but you can’t pay your mortgage, you are accumulating credit card debt or living from paycheck to paycheck. My program focus on both the being and the doing, plus offers more. My program is tailored to your individual needs. This isn’t a one size fits all problem. Each of us have individual behaviors, beliefs, personalities, lifestyles and situations that dictate how we operate, how we see the world and how that manifests in our finances. Step 1 - What Do You Desire? In this step we look at your Hearts desire and the vision for your Financial Future. Using the Law of Attraction you will get clear on what you want and you will set your intention for participating on this Journey to Freedom. • Reduce your debt or credit card spending? • Pay your bills on time? • Establish a spending plan? • Start a savings plan or emergency fund? • Start a vacation savings or savings for large purchases? Step 2 - Where Are You Now? Just like using any map or plan, once you discover what you desire- your goal or final destination, you won't get there unless you are clear about where you are starting from. In this step it's time to get honest with yourself and take responsibility for your finances...facing your present reality. By taking responsibility for where you are, you now have the power to make the changes necessary to get to your destination. • Do you have a spending plan? • What are your spending habits? • Do you have credit card and/or other debt? • How much do you earn? • What are your monthly expenses? • What is your net worth? • Are you saving and investing? Step 3 - What Stops You? Taking actions without addressing the underlying and limiting beliefs will lead you right back to where you are RIGHT now. 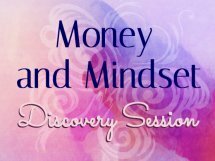 In this step we uncover your hidden beliefs so that you can begin to realign your thoughts, beliefs and actions in the direction that You want to be headed in...towards Your Financial Vision and Goals. Step 4 - How Do You Get There? This is where You and I will create a plan to keep you headed in the right direction, continuing on your Journey and arriving at your destination. You will learn be simple and easy tools that will help you to implement everything you’ve learned in Steps 1, 2 and 3 that work for you and your personality style. This program is offered as a 6-week teleclass and used in personal or group coaching.